Ati-Atihan is my home province’s annual fiesta celebrated in honor of Sto. Niño. Celebrated for centuries now, it is deemed the mother of all Philippine festivals. This entry was posted in Travel and tagged Aklan, Ati-Atihan, Ati-Atihan 2015, Kalibo on February 9, 2015 by milai. Bakhawan is our dialect for mangrove so this eco-park is all about mangroves. Though this has been a popular tourist site since the early 2000’s, I have never been here because it’s quite far from my hometown. And so when I went home last month and my favorite cousin asked me where we should meet, I decided to forego meeting in her office or in our usual restaurant or coffee shop and told her I want to see Bakhawan. We went here on August 24. My cousin is actually the tourism officer of Kalibo so she became my resident tour guide for free. Te he. Note that tamilok demo should be pre-arranged. According to my cousin, this project started in 1990. The non-profit organization Kalibo Save the Mangroves Association (KASAMA), the local government unit of Kalibo and the Department of Environment and National Resources (DENR) spearheaded the project of mangrove reforestation to address the community’s problems on flooding and to provide livelihood for the locals. Originally, they started with only 50 hectares of reclaimed land, but now, it has become a 220-hectare mangrove forest. The project was such a success that it has reaped local and international awards and is dubbed the country’s most successful mangrove reforestation project. I’ve been to a couple of mangrove tours before, but I’ve never been to one as big or as beautifully developed as this one. It’s way better than my mangrove tour in Puerto Princesa, or Camiguin. This is my favorite part of the park. Too bad it had been raining the past days so the water was murky and the weather’s still dreary during my visit. We also agreed to meet here at 4 PM so it was not sunny. Here are more sights and sites from our almost 30-minute walk. These locals are harvesting either Tamilok, clams, or crabs. This is how this project benefits its members. They can get these for free and sell them to tourists or at the market. The walk was tiring but the views made it worthwhile. Originally, the floors were made of bamboo, but they changed it to wood to make it more resilient. It’s more beautiful to look at too. There’s actually a part of the walkway that was still made of bamboo. This is on the last few meters leading to the park’s edge. It was already being replaced with wood, though, when we were there. Though my cousin has been here countless of times, she and her family were so nice to accompany me to the edge of the park. Here, there is a viewdeck where one can see Aklan River. Here’s a collage of more sights at the park’s edge. Afterwards, we decided to rest in one of their cottages. My cousin’s husband also decided to treat us to freshly grilled clams. In our dialect, we call this tuway and it’s a popular ingredient for clam soup. This was actually my first time to eat it grilled. I liked it. It tasted like oysters and because it’s so fresh, it was delicious. And all for just Php 30 a kilo. So cheap, considering that according to my sister, she saw Korean guides in Boracay selling this at Php 400 a kilo. Wow! Talk about highway robbery. After our pit stop, we decided to head home since dusk was starting to settle. Too bad there’s nowhere in the park where sunset can be seen, though the sky did have faint streaks of yellow. Bakhawan Eco-Park is located in New Buswang, which is about 20 minutes from our province’s main municipality of Kalibo. Getting here: From Kalibo, ride a tricycle going to Kalibo Public Market , which we locals refer to as “Tindahan.” Fare is Php 8. Ask to be directed to the tricycle stop of New Buswang-bound tricycles and tell the driver to drop you off at Bakhawan. Fare is again Php 8. You can also rent the whole tricycle for Php 40-50 per way. This entry was posted in Travel and tagged Aklan, Bakhawan Eco-Park, Kalibo on September 16, 2014 by milai. I slung my backpack over my right shoulder as my flight number was announced. I was very excited to go home. I was in such a good mood that seeing someone else sitting on my assigned seat did not faze me one bit, though I did ask him to move. I specifically chose a window seat for my late afternoon flight to catch the sunset and no one’s going to deny me this wish. As the plane hovered over Cebu, I smiled wistfully and wished I didn’t need to leave my hometown for the big city. You see, I was the little girl with big dreams. I left Aklan at sixteen to study in the big city and when I graduated, was hoping to land a good job at home, but since my province is not yet a city, salary rates are way lower than what I would have earned somewhere else. And so I opted to work in Manila and five years ago, relocated in Cebu. The sun’s imminent setting broke my reverie. I looked out my window and watched as the cottony white clouds gradually turn yellow. I also zoomed in some shots of the setting sun. I loved seeing warm shades of yellow and orange and tints of white in the sky. Over time, the sky became more colorful. Reddish hues and periwinkle blue were thrown in into the mix of yellow-orange colors. By the time the captain announced that we were on our final descent, the setting sun was reflecting beautifully on Aklan River. This, and the darker hues of clouds made the sight more visually arresting. I zoomed in a shot and came up with this shot. I loved how the sun’s rays are so clear on this photo. When we landed in Kalibo International Airport, I marveled at how colorful the skyline was. Seeing it and the vast ricefields that were my playground as a child made me realize that indeed, I was home. This entry was posted in Travel and tagged Aklan, Cebu, Kalibo, Sunset on September 9, 2014 by milai. Ambiance: Casual dining. The restaurant serves ribs, burgers, pasta, and other meals. 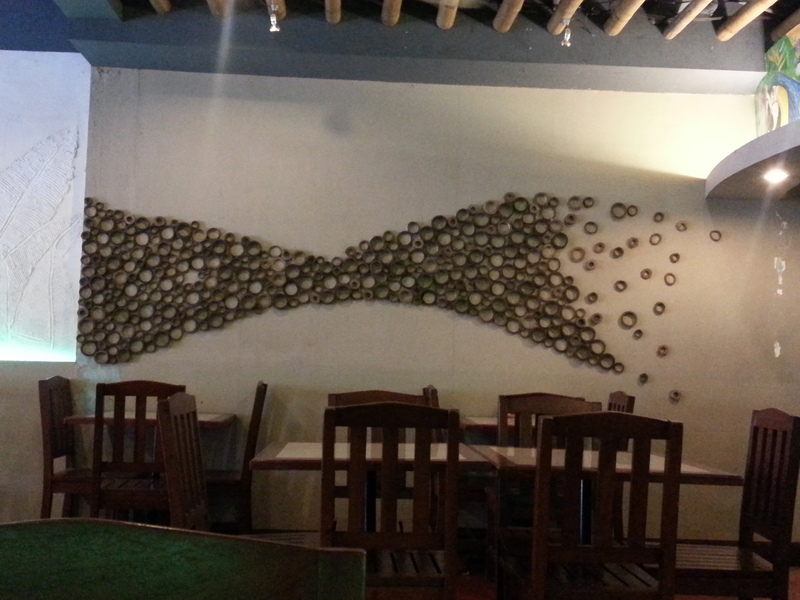 I love this wooden decor on their wall. What I had: I ordered their monster burger that they boasted as “one of the biggest burgers” one will ever have. I was thus expecting a really big and filling burger but was disappointed when it was served. The bun was big all right but that’s the only thing that’s big on my meal. 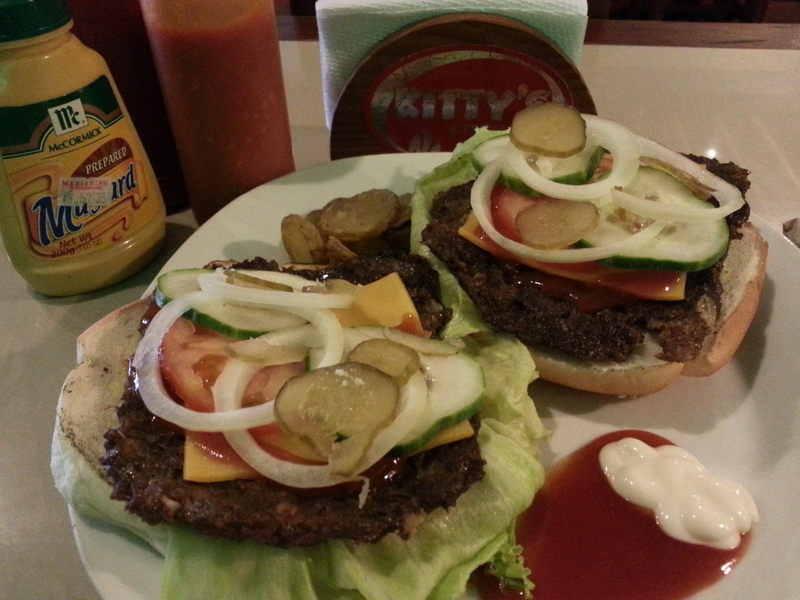 The patties were thin and tasteless and burnt even when I requested for them to be done medium well. The accompanying meager serving of potatoes were sliced so thin a couple had gone crunchy. Ever the cheese lover, I was expecting the cheese to be delicious but it was bland (Kraft Cheddar would have tasted yummier). Then there’s the dollop of ketchup and mayonnaise that made the presentation tacky. For my drinks, I had their coffee shake that was rather sweet. 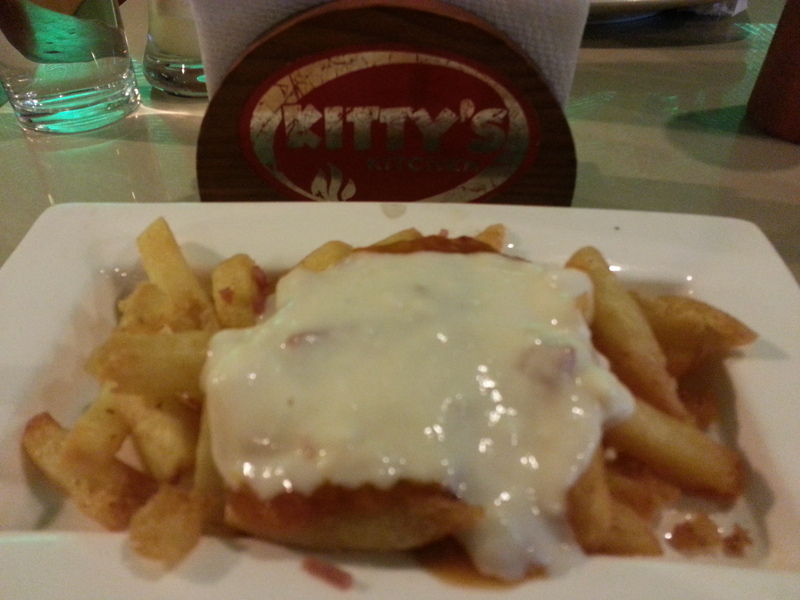 Since I was not very happy with my burger, I ordered French Fries smothered in cheese and I must say that this saved my somewhat disappointing dining experience in this restaurant. The fries were done well (crunchiness and taste-wise) and the generous serving of cheese and what tasted like tomato salsa complemented it. It was so yummy I scraped the cheese and salsa off the plate with my last remaining fries. Service: The service was slow considering that I was the only customer there (later joined by my cousin). The staff also didn’t care if they were horsing around within view of their guest but this may be because they thought I could not understand them talking in their dialect. 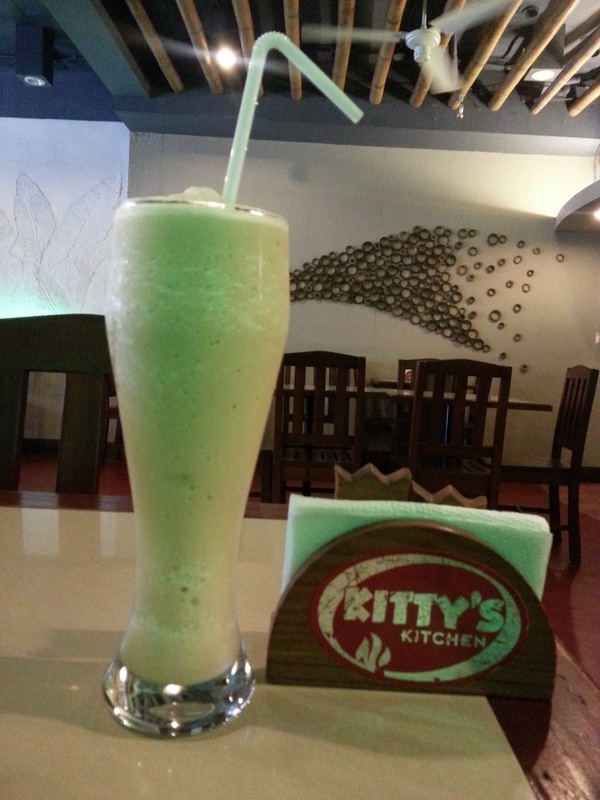 Kitty’s Kitchen is located in Rizal Street, Kalibo, Aklan. Contact them through +63 36 268 9444. This entry was posted in Dining and tagged Aklan, Kalibo, Restaurants on November 16, 2012 by milai.